Dr. Eldad Perahia presented at #WLPC Phoenix in 2018 about looking forward to the next major amendment coming to 802.11 – 11ax. This post is part 1 of that presentation where he shares the issues leading up to 11ax, the goals the 11ax task group are working at accomplishing, and finally a potential timeline for the amendment. Around 2013 while we were wrapping up 802.11ac we started looking forward to what problems we were facing with existing Wi-Fi networks and what we thought we were going to face in future networks. We were getting reports that networks were still having a preponderance of short data frames and we weren’t capable of aggregating those frames like we did with 11n and 11ac which was causing a lot of efficiency hit. We were seeing networks with really dense deployment with overlapping BSS’s. This was impacting potential increase in capacity so we wanted to look at features that perhaps would unlock that capability. And with the whole discussion of 5G we wanted to be more competitive with outdoor cellular. So there was an aspect of the group that wanted to purposefully address outdoor. 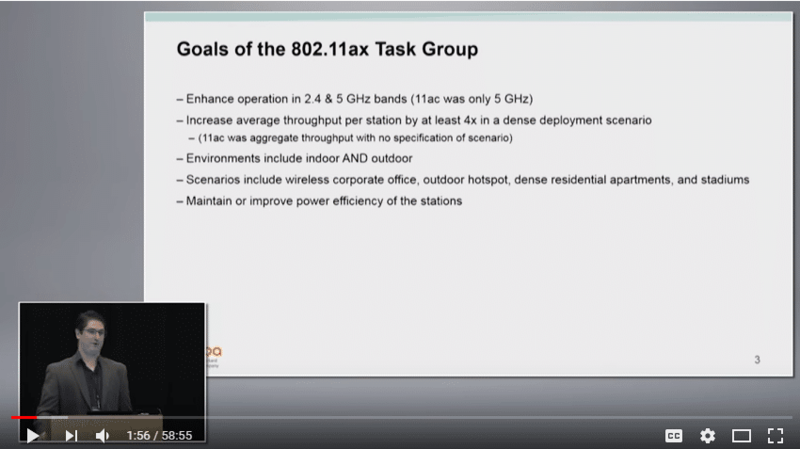 Through 2013 – 2014 the study group came up with a list of goals for what would be the 802.11ax Task Group. We were going to enhance operation in 2.4 and 5GHz. As we all know, 11ac was only in 5GHz. We haven’t had a major enhancement at 2.4 since 11n so we were going to go back and try to improve 2.4GHz as best as we could. Still the major focus is on 5GHz but we’re not excluding 2.4 this time around. 11n and 11ac focuses on throughput, on the aggregate throughput. You can always trick this. If you have 100 clients you can just not serve 99 of them and only serve one client which will get you really high aggregate throughput, but that doesn’t give you very good average throughput across the BSS or the cell. So we’re going to focus on on average throughput per station. We’re going to try to get 4x. Hopefully we’re going to have enough features in 11ax to do that. We’re going to look at environments indoor and outdoor this time. We’re going to have a wide range of scenarios where we’re seeing a lot of dense deployment. Increase in density in a corporate office, outdoor hotspot, apartment buildings where you have dense deployments and nearby residential, and stadiums. 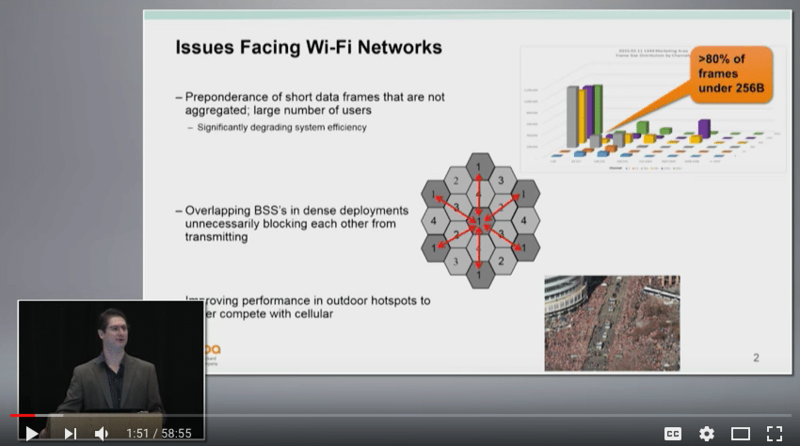 We’re seeing a lot of Wi-Fi deployment stadiums and those are really problematic. As usual, with any major amendment we try to improve the power efficiency at the clients. Before I actually get into anything too technical most people ask, “When is this is coming out?” so I’m going to start with the slide of when it’s coming out. just to see how realistic that is I also displayed 11ac timeline. We had the task group kickoff in May 2014. For 11ax we did things a little different. Each amendment 11n and 11ac there was a special interest group who got together and started brainstorming. You can see with 11ac it started well after the starter task group, well this time it started beforehand. But it took them a long time to get to draft .1. So that’s just going to give us an idea of the realistic timelines here. From .1 to recently 1.0 took them quite a long time. Even though the task group appears to be working in line with the time frame of 11ac, it’s actually taking a lot more time. We’re going to see that because there’s a lot more features in 11ax than there were in 11ac. 11ac essentially did downlink multi-user mimo and did 80, 60MHz channels but nothing theoretically more interesting than that. So 11ax we’re going to see a lot more features of just taking a lot of time to to craft. We’re predicting May for 2.0 – that’s never going to happen. There were 7,000 comments compared to 11ac which had a couple thousand comments in draft 1.0. Based on how long it took to take 1.0 to 2.0 for 11ac, hopefully 1.0, maybe to get the comments done, I don’t know maybe in the fall. We were predicting a faster schedule than 11ax to be done by the end of 2018 but we’re looking at 2019. That said we’ve seen now for 10 years that when the standard finishes has really little relevance to when the products come out. 11n draft product came out of 2.0 11ac came out of 3.0 so Wi-Fi Alliance is already starting the process of developing a certification plan. Hopefully 2.0 and 3.0 will come out somewhere the first half of 2018 the spec and then we are targeting that we can be certifying in 2018 but probably early 2019. 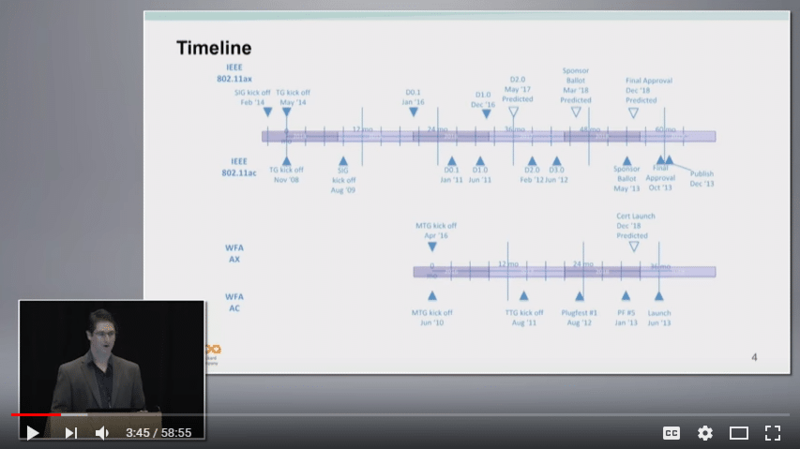 We look at the Wi-Fi Alliance certification plan, 11ac took about 36 months, so the same time would put us at the first half of 2019 to have a certification plan. I’m a little concerned this may slip as well because the number of features are much much larger and so the amount of tests that need to be developed is going to push it to be much longer than a certification development time for 11ac but hopefully somewhere in the first half of 2019. Note – these transcripts have been edited for clarity.